Sri Ram Navami is celebrated as the birthday of Lord Ram. It falls on the ninth day of Shukla Paksha (waxing phase of moon) in the month of Chait or Chaitra (March – April). Ram Navami 2019 date is April 13. It is marked on April 14 in some regions. It also marks the end of the Chaitra Navratri. Lord Rama is the seventh incarnation of Lord Vishnu and is known as Maryada Purushottam – an embodiment of chivalry and virtue. Bhagavan Sri Ram was on Chaitra Shukla Paksha Navami (ninth day during the waxing phase of moon in Chaitra month) in Punarvasu Nakshatra on Karka Rashi. In North India, Ram Navami is a nine-day festival and is the final day of Chaitra or Vasant Navratri. The period is also observed as Ramayana week in many parts of India. Hindu devotees fast on the day and pujas are performed at noon, as it is believed that Lord Rama was born at this time. On the occasion, special pujas are held at home and in all Lord Ram and Vishnu temples in India and around the world. The day is of great importance at the Tirupati Balaji Temple in Andhra Pradesh. The pujas and rituals are spread over two days. The Brahmotsavam at the world famous Bhadrachalam Sri Rama Temple is observed on the day. Swaminarayan Jayanti is observed on Ram Navami day. The devotional songs sung include any one Ram Bhajan or Vishnu Sahasranama. Ramayana, especially the chapter Bala Khanda, is recited on the day. 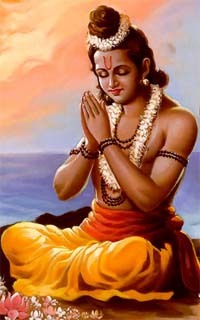 The name of Bhagavan Sri Ram is a wish-yielding tree, the very home of beatitude in this age of Kali (current era – the dark kali yuga), by remembering which Tulsidas was transformed from an intoxicating drug like the hemp plant into the holy basil. Not only in this Kali age, but in all the four ages, at all times (past, present and future) and in all three spheres (viz., heaven, earth and the subterranean region) creatures have been rid of grief by repeating the name of Sri Ram.